Bookings for the fairandfunky Fairtrade Conference for Schools; ‘Stand Up For Farmers!’ are now open. 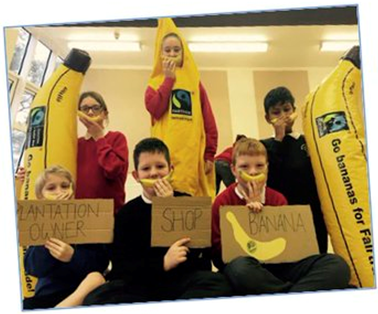 Taking place on Friday 13 May from 9.15am to 2.30pm at Halifax Minster, ‘Stand Up For Farmers’ brings together Primary Schools from across Calderdale to celebrate World Fairtrade Day. This is the first conference in Calderdale to combine Fairtrade and the arts, offering professional development for teachers and innovative learning for students including interactive workshops involving drama, musical composition, real life stories and more. Cost is £110 per school – this includes 8 pupils and 2 teachers or make the most of the Early Bird Booking Offer for £100 per school when booked before the end of Spring term. This entry was posted in Get Involved / Have Your Say, May and tagged calderdale, Conference, Educational, Event, Fairandfunky, Get Involved, Halifax, Halifax Minster, May, Schools, Stand Up For Farmers, World Fairtrade Day, Young People.